We’d love your help. Let us know what’s wrong with this preview of Human Transit by Jarrett Walker. Public transit is a powerful tool for addressing a huge range of urban problems, including traffic congestion and economic development as well as climate change. But while many people support transit in the abstract, it's often hard to channel that support into good transit investments. Part of the problem is that transit debates attract many kinds of experts, who often t Public transit is a powerful tool for addressing a huge range of urban problems, including traffic congestion and economic development as well as climate change. But while many people support transit in the abstract, it's often hard to channel that support into good transit investments. Part of the problem is that transit debates attract many kinds of experts, who often talk past each other. Ordinary people listen to a little of this and decide that transit is impossible to figure out. To ask other readers questions about Human Transit, please sign up. I've read Jarrett Walker's blog on transit planning a number of times, and always found it insightful. He thinks deeply about transit and how to use to build great cities and communities. However, his experience and expertise (although quite broad) is limited to Western, developed countries. The books has a number of different sections on various aspects of the passenger's experience of transit and how to improve them, what the pros and cons of various ideas are, and a fairly lucid explanation of I've read Jarrett Walker's blog on transit planning a number of times, and always found it insightful. He thinks deeply about transit and how to use to build great cities and communities. However, his experience and expertise (although quite broad) is limited to Western, developed countries. The books has a number of different sections on various aspects of the passenger's experience of transit and how to improve them, what the pros and cons of various ideas are, and a fairly lucid explanation of how the layout and street network pattern of a city influences transit choices (he uses the term 'urban geometry'). While he says that 'density isn't destiny', I'm sure he'd agree that geometry is. 1. He spends too little time going into how public transit is financed. This is crucial to understand because it answers questions of how much we should expect from transit, and why agencies are only able to run buses at the frequencies they do. In an Indian context, I would go further to say that it helps understand why we have such uncomfortable buses and routes that don't make much sense. 2. Walker mentions pedestrians often because, as he rightly points out, transit users are very likely to be pedestrians at one or both ends of their trip on a bus, train, or streetcar. Then why not address the fact that unless there is adequate pedestrian infrastructure, transit will always suffer from lower ridership than is strictly necessary? That transit's ability to shift people from cars depends heavily on people being able to hoof it to the bus stop? This was a glaring omission to me. In my days of transit advocacy, I had wished a book like "Human Transit" were around. It would have made my route and service proposals easier to understand and implement. By coincidence, I had incorporated many of Walker's theories -- direct, grid-based routes whenever possible and using frequency to attract ridership -- but have never attempted to explain my logic behind my proposals. Even if I did, I wouldn't be able to explain myself as concisely and sharply as Walker. "Human Transit" doesn't In my days of transit advocacy, I had wished a book like "Human Transit" were around. It would have made my route and service proposals easier to understand and implement. "Human Transit" doesn't have a magic explanation of the right type of transit service for your city, and it avoids taking sides in bus vs. rail or any other technology-of-choice debates, but it provides an even better function. It shows all readers how to think about service: coverage, productivity and route structure. Walker uses the phrase "plumber's question" to come to trade-offs when it comes to questions about how to allocate resources. One is coverage vs. frequency. Should a transit system grant a minimum coverage span to all of its service area, or should it concentrate vehicles to where they will be used the most? There's no right answer to the question, and a transit system must incorporate elements of both. Another facet to consider: Transit routes are a matter of geometry. Every transit system is a quilt of radii, diameters and vectors. First, there's access and destination. There's a certain radius where a bus stop or rail station draws and doesn't draw riders. Then, there is a matter of stop spacing. Put them close enough together, and two stops draw from a redundant area of riders. Spread them apart, there's less duplication but there's a greater chance that riders are pushed out of a convenient stop radius. Finally, there are routes. It's mathematically obvious that the fastest path between two points is a straight line -- and also the most time- and cost-efficient for route planning. However, it's not always possible to go straight. Sometimes, a line has to deviate away from a straight line, or even "dogleg" by leaving the straight line and doubling back. If this sounds complicated, "Human Transit" makes it straightforward. It is handy for both professionals, to get an idea of how to plan routes around making them useful for riders' origins and destinations, and riders, to better articulate routes for themselves while getting an idea of what goes into service planning. Once in transit directions mode, the map ought to show roads where there are high frequency buses as thicker or otherwise highlighted just as arterials and highways are highlighted for cars. If there is no transit service on a given road, de-emphasize it. Adjust for time of day as necessary. It should be possible to view this map even without having specific origins or destinations, just to see where one might easily travel without much planning. Weight routes on high frequency buses more strongly than low, even if it requires a bit more time or walking. Secondly, make frequency appear in the route suggestions. Mixed transit/bicycle directions are somewhat specialized but ought to be incorporated eventually also. I am going to be generous and give this book three stars, because if you are a driver who is only just beginning to consider the concept of public transportation, this is probably a useful book. As someone who does not drive and is deeply engaged with transit, I found it patronizing and tedious. That doesn't mean Walker isn't right; it just means he's telling me a whole lot of things I already know, and phrasing them as though they should come as revelations. Unbelievable book. This is the holy grail for any transit enthusiast when it comes to planning a system. People who are not interested in public transit and drive everywhere would probably find it boring, though. The book is written as a textbook for public transit. It breaks down transit planning into its fundamental tradeoffs, and takes an ostensibly neutral position in exploring them. It explores the motivations behind public transit efforts, and implores you to hold them consciously and with an understanding of their impacts. e.g. If you want a system with full coverage for your community, that inherently comes at the expense of ridership, and so income. If you want to minimize connections you need to The book is written as a textbook for public transit. It breaks down transit planning into its fundamental tradeoffs, and takes an ostensibly neutral position in exploring them. It explores the motivations behind public transit efforts, and implores you to hold them consciously and with an understanding of their impacts. e.g. If you want a system with full coverage for your community, that inherently comes at the expense of ridership, and so income. If you want to minimize connections you need to trade that off with the frequency of service along your lines and the simplicity of your network. etc. The author stresses that many decisions which appear to disregard community input stem from requirements imposed by geometry, and these inherent tradeoffs. Clarity. 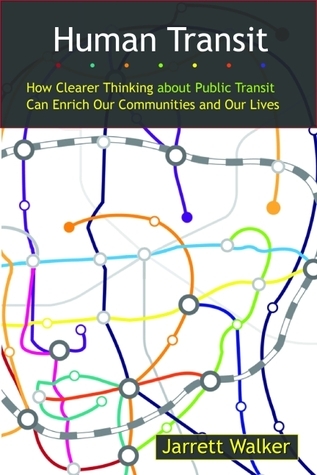 That's what Jarrett Walker's book promises in its subtitle: "How Clearer Thinking About Public Transit Can Enrich Our Communities and Our Lives" and clarity is what this book delivers. Public transport is a complex issue with many different considerations and interests at play. Walker breaks these issues down one by one and in simple, layman language, offers us different frames with which to analyse transport matters. Chapter 2 breaks down the different (sometimes conflicting) demands p Clarity. That's what Jarrett Walker's book promises in its subtitle: "How Clearer Thinking About Public Transit Can Enrich Our Communities and Our Lives" and clarity is what this book delivers. Public transport is a complex issue with many different considerations and interests at play. Walker breaks these issues down one by one and in simple, layman language, offers us different frames with which to analyse transport matters. Chapter 2 breaks down the different (sometimes conflicting) demands placed on transit: the location of stops and stations; connectivity; frequency; efficiency; value for money (cost to the consumer); civility; reliability; and the ability to support spontaneity (through frequency and the legibility of the network).The rest of the book delves into each of these different demands in some detail and some of the trade-offs entailed. For instance, the trade off between minimising coverage gaps and minimising duplicate coverage areas when planning the placement of transit stops. And how "one of the most common mistakes in transit planning is to invent a new line, in response to some political initiative, without thinking about how it affects the existing lines that it may overlap....by creating duplicate coverage, it often leads to a less efficient network overall". Or viewing transit demands as "peak-first" (where peak service is the most fundamental product and the other times of the day are secondary/supplemental) vs "base-first". Or the trade off between ridership and coverage goals in determining service allocation, between system complexity or requiring more connections for passengers. "Frequency and span are the essence of freedom for a transit passenger. High-frequency, long-span service is there whenever you want to use it, even for spontaneous trips....Yet frequency and span are also oddly invisible....You see maps of the network or of certain transit proposals; you read descriptions of transit proposals in the newspaper, often accompanied by maps, always emphasising where the proposed service will operate; you see images of transit vehicles in film, television and music video, often used in ways that encourage you to generalise about the quality of the service and the types of people who use it....But nothing in any of those impressions shows you the impact of frequency,even though...frequency is the single most important variable in meeting our mobility desires...To be useful, transit must exist in both time and space"
"Transit debates suffer from the fact that today, in most of our cities, most of our decision makers are motorists...driving a car every day can shape your thinking in powerful, subconscious ways. For example, in most debates about proposed rapid transit lines, the speed of the proposed device gets more politics attention than how frequently it runs, even though frequency, which determines waiting time, often matters more then speed in determining how long your trip will take"
"Many transportation planners are trained in the work of evaluating lines. This process - including conceptualisation, design, and estimation of expected usage - tends to be peak-first. Classic highway engineering, for example, designs a road to handle the traffic that it will carry on the peak and isn't bothered by the fact that these roads will be relatively empty for the other 20 or more hours of the day. If you carry that view into transit planning, you'll design services and infrastructure for the peak as well" But what kinds of options will you provide during off-peak hours? Walker's book doesn't offer any solutions. Because the best solution for any place will depend on the values that people want to see reflected in their public transport: coverage or ridership? system complexity or connections? etc etc. But what his book does do is to offer frames with which to unpack and discuss these issues. (I particularly liked Walker's suggestion of developing a consensus around a Service Allocation Policy, where there is a percentage split of resources between different goals, e.g. 55 percent of services allocated to the ridership goal and 45 percent to the coverage goal). Placeholder review: this is a classic of the field of transportation planning and I'm really glad I have finally filled the gap. It's a classic for good reason. Walker gives a number of wonderful tools to evaluate transit options. Notes: I'm trying to read 52 books this year. To make sure I'm getting a broad range, I'm tracking some metrics. Op Placeholder review: this is a classic of the field of transportation planning and I'm really glad I have finally filled the gap. It's a classic for good reason. Walker gives a number of wonderful tools to evaluate transit options. Not technical enough to give a very deep understanding of transit, but too pedantic to be enjoyable for a lay audience. To the first point, for example, there is no math in the entire book. There are not even descriptions of the mathematical underpinnings. Instead, he gives hand-wavey arguments for stop spacing and network design. Then again, I'm a civil engineer currently working on my masters in transportation engineering, so my perspective might be a little skewed cf most readers. To the secon Not technical enough to give a very deep understanding of transit, but too pedantic to be enjoyable for a lay audience. To the second point: the author spends pages and pages trying to clarify ideas that any reader of this book should be familiar with. He spends two pages defining "public transit" and then defining the words he used to define "public transit". Sentences like "If a transit route is not direct, compared to the alternatives, we say it is circuitous" and "Transit planners say a network is peaked if it carries more riders during the peak commute period than in the midday, evening, and weekend periods" abound. In his effort to be precise, he forgets about the reader. Definitions are important, but put it in a footnote or a glossary. Transit services shapes our city and impact our daily life. Therefore many people may want to voice their opinion on the design and operation of transit system. But few people knows how to think about the working of a transit system systematically. Transit consultant Jarrett Walker's book provide excellent guidance to citizen and government alike to think about what they need from transit service. He explains the key points that makes transit useful. Then explores basic geometry and the implicat Transit services shapes our city and impact our daily life. Therefore many people may want to voice their opinion on the design and operation of transit system. But few people knows how to think about the working of a transit system systematically. Transit consultant Jarrett Walker's book provide excellent guidance to citizen and government alike to think about what they need from transit service. He explains the key points that makes transit useful. Then explores basic geometry and the implication of various routing options, and also the many trade off of coverage, speed, frequency and network complexity, etc. All these concepts are explained in simple layman's term. Yet it gives a holistic view to the problem without fixate any simple choice such as rail v.s. bus. The book ends in an inspiring finale. Walker invite people to take a long view and think what their transit should be in 20 years. The biggest payoff will rest in strategic think. This excellent does exactly what the subtitle promises, to guide clear thinking about public transit so as to enrich our communities and our lives. The book is easy for laymen, like me, to read. But it's no Suburban Nation (a book), so it won't change your world view on the built environment. Still, I gave it five stars, because it addressed all the questions I had. Questions like, why does transit work well (when it does) and how does it fail the transit user when it doesn't? What makes people want to use transit? If you live in an community with older residents, why would your transit system be different than the one in a community with y The book is easy for laymen, like me, to read. But it's no Suburban Nation (a book), so it won't change your world view on the built environment. Still, I gave it five stars, because it addressed all the questions I had. Questions like, why does transit work well (when it does) and how does it fail the transit user when it doesn't? What makes people want to use transit? If you live in an community with older residents, why would your transit system be different than the one in a community with younger residents? What is more important, frequency or speed in transit? What mistakes do automobile travelers make when thinking about transit? I thought I already had a clear picture of the options for transit, but this book did a great job of laying out the terms and tradeoffs really clearly, and I can see a number of the choices in Vancouver much better now. Our city is doing a pretty good job... it would be nice if all the debates could be so rational. I'm giving this five stars, but for the record, you'll only enjoy this if you're a huge nerd who enjoys transport policy or engineering. If you are one of those people, this book if the best I've ever read on the subject. A practical book for practical thinking. Excellent book if you are interested in urban design and the way transit systems work. Easy to read with good examples. I would rate the book higher if I read it sooner. A great book for those who want to explore how the transit systems work. This is a textbook for the curious but uniformed transit enthusiast. It lays out the skeleton structure for all the things that go into transit planning, how decisions are made, what are the inevitable trade-offs and how those choices are made in varying contexts. The ample use of case studies to draw out various scenarios of how different decisions have played out is extremely useful in both understanding how the options turned out in practice and why they failed or succeeded. According to the This is a textbook for the curious but uniformed transit enthusiast. It lays out the skeleton structure for all the things that go into transit planning, how decisions are made, what are the inevitable trade-offs and how those choices are made in varying contexts. The ample use of case studies to draw out various scenarios of how different decisions have played out is extremely useful in both understanding how the options turned out in practice and why they failed or succeeded. According to the author it is crucial to understand the influence of urban geometry in determining how transit is planned and the limitations it will face. Every other planning decision will be conditioned by the nature of a city’s geometry. The urban composition of the area including spread and population density are other important factors. The decisions that need to be made, some of the important trade-offs he highlights include that between ridership and coverage, planning for peak hours only versus all day service, direct service versus enabling connections, determining fares and the manner of collection etc. After urban geometry, another key point the author stresses on is the importance of frequency of a given transit technology. Enabling greater frequency is key to reducing wait time and uncertainty about the service and it is important to focus on it rather than on speed to reduce the total travel time for a transit user. Effective transit can be provide freedom to the user by enhancing her/his mobility. By carrying a greater number of people in a given space, it is also more sustainable than a car. My favorite chapter was the one titled “five paths to confusion”. He does a good job of establishing the causes for confusion, how they emerge, and what the ways to deal with them are. Giving an understanding of why they emerge helps one understand how to avoid a certain pattern of thinking that seems easy but may be erroneous. Given that he says the physical form is key to determining how transit is planned, I wonder how that will work in a city that is growing organically and in a somewhat ad hoc manner. How do we increase access of these services to informal settlements that sprout up illegally and whose population is more often than not invisible in government records. Being population likely to be most dependent on transit, how do we accommodate their fares and access? While the author stressed upon the importance of pedestrian infrastructure to enable and increase transit users, there was little to no mention about safety within transit itself or of personal safety of women on the streets, the absence of which may be a deterrent to using their transit. He mentions the role of politics in influencing decisions a little too briefly. I hope a later edition of the book includes insights from transit in cities of developing countries in greater detail as opposed to a sprinkle here and there. A complete introduction to transit planning and operation. - The writing is perfect (the author has a phd in Literature, I think)! Great systematic walkthrough of the common challenges and inherent trade-offs of designing public transit networks. Wonky, but very accessible for those interested in urban transport planning. Walker's a great writer and communicator. A good way to explain how effective transit design works to those who do not work in the industry. A really fantastic book of clear prose about transit. It's a nice read but about such fundamental truths what I wasn't as engaged as learning something new even if the presentation is great. A good guidebook to transit planning, with some level oversimplification. This is a fascinating discussion of the geometry of transit within cities. It's so different than the geometry of cars. This book has definitely added clarity to my thoughts on Transit Planning. It is very technical, but explained well. A great easy-to-understand guide to understanding transit planning for the average person who doesn't necessarily have the technical background. Engaging and presents the issues of transit in a clear, concise, comprehensive and compelling way. Well written, lucid, and completely enjoyable. Highly recommended.